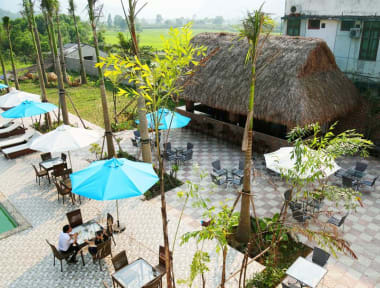 The Heritage By Night Hotel is located in the Phong Nha village center. The hotel is surrounded by gorgeous karst-mountains that rise up high in the air. The boat station from which most tours depart is only 400 meters further down the road. And all tourism sites in the area can be reached easily from our hotel. The Heritage By Night Hotel has something to offer for any type of visitor. For those on a budget we have luxury dorm rooms all equipped with air-conditioning. Free breakfast & free WI-FI! For visitors that aim for a bit luxury we offer 22 private rooms with double beds, flat screens, large bathrooms, room service, free-WI-FI, free breakfast. The entire hotel was renovated in 2015, all the facilities and room are brand new and have good working equipment like tv's, air-conditioning & a fridge. 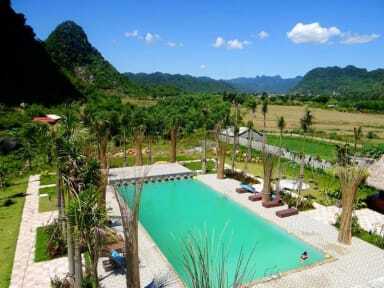 A large pool is located at the back side of the hotel with view on the magnificent karst mountains. Our hotel is under the management of the Phong Nha-Ke Bang Tourism Center and therefore we can offer exclusive tours for very sharp prices. With over 20 years of experience we guarantee a amazing stay in Phong Nha! 2).Check-in time: after 14:00pm. Early check in (05:00am – 09:00am) will result in a 30% increased room rate charge. Check-out time: before 12:00am, later check out (12:00 am – 14:00 pm) will result in an 30% increased room rate charge. Even later check-out (14:00 – 17:00) will result in a 50% incread room rate charge. Later check-out than 17:00 will result in a 100% increased room rate charge. 4).We accept cash(Dollars and Euros) payment only upon arrival. 7).Weapons, Poisons, Explosives and Pets are strictly prohibited in the hotel. 8).No gambling or the use of drugs is allowed in the entire hotel area. Guests are completely responsible for any activity that break the rules and laws of the Vietnamese government. 9). No cooking and ironing in the hotel rooms, no smoking on the hotel beds. 10).When leaving the room; Light shall be turned off, doors locked and windows closed. The room key must be given to the receptionist before leaving the hotel. (we will charge 100,000 VND for a lost key). 11).It is not allowed to invite guests to the room, unless permission is granted by the hotel’s management board. 12). Rooms shall be kept clean, and no paper and waste should be thrown into hygienic devices. 13).Keep the volume of radio and TV on a level so that other guests won’t be bothered. 14).Do not arbitrarily move any property out of the rooms without the hotel management’s permission. Guests must compensate the hotel for any lost or damaged property by 100% of the property’s current price. Stayed here with a few friends, and we loved it! Our 6 share dorm was very clean, we had our own bathroom, and security lockers. Awesome outdoor pool with beautiful scenery. Free, good breakfast. Definitely a great place to stay if you're looking for a quiet, laid back experience. The staff was also very friendly and helpful. Really nice room, there were two of us staying in a 6 bed dorm and had it completely to ourselves. Very spacious and the views were amazing from the pool area. Loads of breakfast options, cooked really well. It was fine! Nice and cheap for a good location, close enough to Easy Tiger hostel that we felt safe walking to and from the party, but not so close it was too loud! Beds in the dorm were a little hard for my liking, but it was great for the amount we paid! Would recommend! The service we received here was terrible. Our room wasn't available when we arrived to check in at 9pm so was located in another room. One of our bags went missing from the dormitory and was later located at reception only due to another guest advising us that the receptionist had taken the bag out of our room with no explanation. When confronting the receptionist why she stole our bag from our room she did not have any apology or sufficient explanation. Would never stay here again. This is the worst place i have ever stayed in. Mould in rooms, very dirty everywhere, the sheets wasnt washed so we had to ask for new because they were dirty, didnt even get a single “sorry” I could list so many things wrong at this place. Just dont go there. We arrived at our accommodation to find the rooms were damp and mould was everywhere. It was not healthy at all. We checked out immediately.